Mangin, born in Cherbourg, was a pupil of Harpignies and J.-P. Laurens. He exhibited watercolors and drawings at the Paris Salon exhibitions from 1875 to 1914, and was known for portraits, landscapes, and architectural studies. He was awarded a prize at the Salon of 1895. Mangin was commissioned by the French government to paint three views for the Musée de l’Ecole des Ponts et Chaussées (Museum of the School of Bridges and Roads). The School of Bridges and Roads is an important engineering school in Paris and has a famous collection of paintings, drawings, and photographs which document the history of engineering projects in France, mainly between 1750 and 1880. The paintings by Mangin in the Museum are A View of the Bridge of Andelys, A View of the Viaduct of la Selle, and A View of the Viaduct of Cizes. 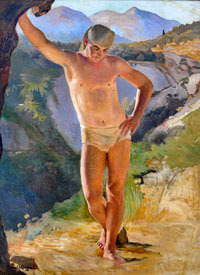 In this painting, Mangin has borrowed a pose from classical Greek statuary for his model. The figure seems to derive from the Apollo Sauroctonas, 350-330 BC, a Roman marble copy of a bronze original by Praxiteles in the Vatican Museums, with which Mangin may well have been familiar. Listed: Bénézit, Dictionnaire des Peintres, Sculpteurs, Dessinateurs et Graveurs (1999).